The ancient Greeks divided themselves into four main ethnic groups based on language family: the Achaeans, the Aeolians, the Dorians, and the Ionians. The exact origin of each of these groups is not known, but according to Herodotus , the Dorians were the last to arrive in Greece and came from the north. They first came into contact with Aeolians in Thessaly, then they swept down into the Pelleponese were they came into contact with the Achaeans and Ionians. 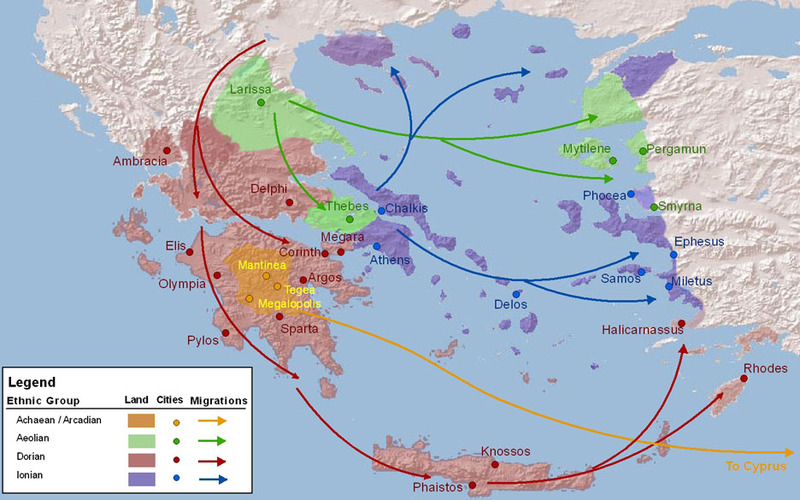 Whilst the archaeological record remains thin on the exact movement of the Dorians and to what extent their migrations were accompanied by conflict, what is known is that, by 950 BC much of the Peloponnese was now speaking Dorian languages, where they had been speaking Achaean before, and that at about this same time, each of the other three groups were leaving mainland Greece and colonizing the East, the Aeolians and Ionians went to the eastern shores of the Aegean, and the Achaeans went to Cyprus. So a certain amount of displacement had definitely occurred.